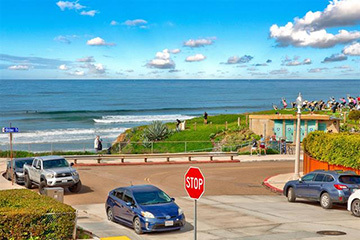 Panoramic Ocean, Whitewater, Coastline, Sunset and Palisades Park (Law St) views! West of Mission Blvd! Stones throw to Ocean Blvd! Endless opportunities for rehabbing or redeveloping this coastal gem! Existing property consists of a 4 bdrm, 2 bath, 1,540 sq ft split level home facing Law St & detached 600 sq ft studio/1 bedrm! Studio/1 bedrm rents for $1900.00 per month! Current zoning RM-1-1 per City SD! Park 4 cars off alley plus potential off street parking at Law St! Solar powered! La Jolla Schools!